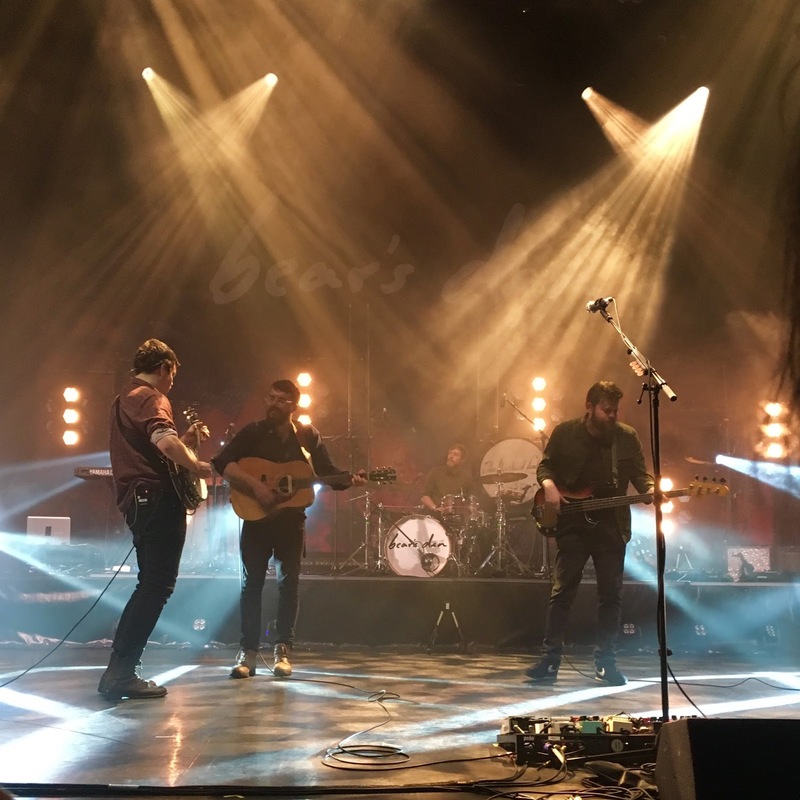 On Wednesday night Bear's Den played their biggest headline show yet to a 5000-strong crowd at London's Eventim Apollo with the incredible Seramic and Banfi, an absolutely incredible line-up. They're a band completely at the top of their game and I'm so glad I was able to make the show, in a quite miraculous turn of events... having booked a ticket for Hamlet at Almeida Theatre a couple of months ago I checked my booking confirmation in the early hours of the morning to discover it was for the matinee, not the evening performance as I had thought. I was lucky to find somebody giving away a ticket for the gig for free and after rushing through central London to meet her, made it on time to the play, which was totally wonderful. Bit of a cliché but Andrew Scott was born to be Hamlet! Despite the play being four hours long and travelling through the city in rush hour, after queuing for a short while I managed to join my friends in the centre of the barrier. I'm a total advocate of going to gigs alone, but there's also something really special about enjoying an evening of live music with a group of people who you know through liking the band! First up, one of my favourite new (ish) bands Banfi took to the stage, having opened up for the whole Europe/UK tour. It was so great to get to see them again (particularly as I think I'll be missing their final residency show at The Old Blue Last - last free tickets here) and I'm already looking forward to hopefully catching them at a couple of festivals this Summer, and on their own tour in September (dates and tickets all here!) If they're new to you, check out June for Secret Sessions! Next up were Seramic, part of the reason I was really keen to get along to the London show as they weren't supporting at the show in Oxford a couple of weeks ago. It's pretty difficult to listen to them at any point and not want to break into dance, but particularly in the live setting as their energy is infectious, especially Marcus' moves! Performing tracks from the Found EP and the recent single Same Mistakes (on Soundcloud) they really got the party started and I can't wait to hear the new EP which should be out over the next month or so. Having already been treated to two wonderful performances we were in for even more of a treat as the Bear's Den lads walked out to the Terminator theme, no less... dramatic stuff, kicking off their set with a couple of tracks from last year's Red Earth & Pouring Rain. It was clear we were in for a beautiful evening and the band had the crowd singing in all the right places and giving endless rounds of applause between tracks. The set was a little different from Oxford - much to my delight they played Magdalene, my favourite track from their first record! After joking about dreaming of a world in which bands return to the stage to play some more songs, they did just that and treated us to an unplugged performance of Bad Blood (they didn't brave entering the crowd as in Oxford, though I don't blame them) and a happy birthday sing along to their drummer Jools before finishing up with the big hit, Agape, and the crowd responded with tons more applause. They finish up their European tour with three shows this week in the Netherlands and Belgium before heading back to London for a Record Store Day show for Richer Unsigned on 22nd April (details here) - if the ticket gods fancy blessing me with a ticket for that show, that'd be great!